Brace for a wave of defaults in the oil patch. Energy companies that loaded up on debt during the oil boom are likely to have trouble paying back those loans. Oil prices have collapsed over 65% since the middle of last year to below $37 a barrel this week and there's no recovery in sight. It's fueling financial turmoil on Wall Street with Standard & Poor's Ratings Service recently warning that a stunning 50% of energy junk bonds are "distressed," meaning they are at risk of default. Overall, about $180 billion of debt is distressed. It's the highest level since the end of the Great Recession and much of it is in energy companies. "The wave of energy defaults looming in the wings could make for some very bumpy roads ahead in 2016," Bespoke Investment Group wrote in a recent report. The firm described the junk bond market environment as "pretty terrible" lately. 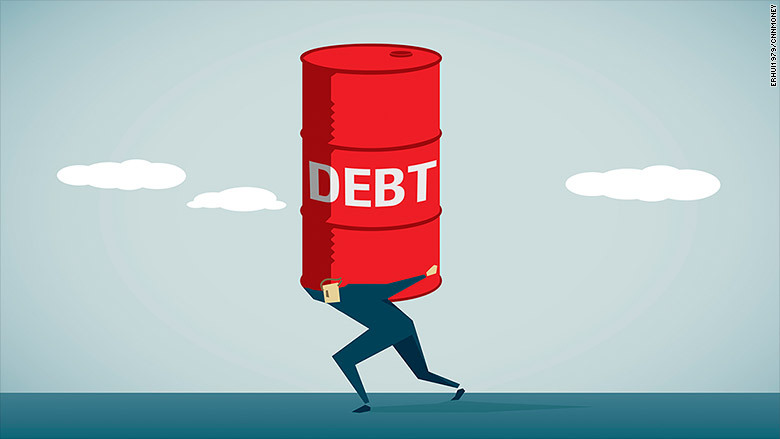 That's a dramatic change from recent go-go years, when the shale oil boom along with cheap borrowing costs allowed energy companies to take on loads of debt to fund expensive drilling operations. U.S. oil production skyrocketed, creating a gigantic supply glut that is currently pushing prices lower and hurting the ability of many energy companies to repay their debt. "The tide may be turning. Excess leverage during the good years has dented credit profiles," analysts at research firm Markit wrote in a report published on Wednesday. Of course, it's not just oil companies under financial duress. S&P said a whopping 72% of the bonds in the metals, mining and steel industry are now distressed. That makes sense given the fact that prices for raw materials like copper, iron ore, aluminum and platinum have recently plummeted to crisis levels. It's so bad that a key Bloomberg index of commodity prices is now sitting at its lowest level since 1999. No matter the sector, these financially stressed companies will be forced to cut costs by selling off assets and laying off workers. Corporate defaults are already on the rise. S&P said defaults recently topped 100 on the year, the first time that's happened since 2009. Almost one-third of 2015's defaults have come from oil, gas or energy companies. S&P warns the high level of distressed bonds is an indicator that more defaults are coming. The firm said being classified as "distressed" reflects an "increased need for capital and is typically a precursor to more defaults." At a time when oil and natural gas prices are super low, there's more bad financial news for these companies -- a change in the interest rate environment. The U.S. Federal Reserve is expected to raise interest rates next week for the first time in nearly a decade, a move that will likely hurt demand for risky assets. Which companies could be next? The list of distressed oil and gas companies features mostly small and midsized companies, though it does include some big names like Chesapeake Energy (CHK). Carl Icahn owns a big chunk of Chesapeake, a natural gas and oil company whose stock price has plummeted 76% so far this year. Chesapeake is trying to ease its massive $11 billion debt load by getting investors to sell their bonds back to the company at a lower value. Other energy companies on the distressed list include Denbury Resources (DNR), Linn Energy (LINE)and Transocean (RIG) -- all of which have been slammed by cheap oil prices. The good news is that few believe the commodity-fueled default wave will cause an all-out financial crisis like the mortgage bond storm did in 2008. That's at least partially because banks are stronger and better able to withstand financial storms. "This is a cautionary tale -- but for the moment should not really impinge on the rest of the financial system," said Nicholas Colas, chief market strategist at ConvergEx.